This 32-piece set of assorted pegboards hooks is the answer for all of your many storage and organization needs throughout the house, garage and in the toolshed. Made from durable steel and with plastic stabilizing clips included, this general-purpose selection of pegboard hooks will make hanging, storing or displaying your things simple. A messy workbench not only makes finishing any job that much longer, but looking for tools can be frustrating. These 2-inch double arm pegboard hooks can hold securely in place a wide assortment of tools or items found in every workshop so they're off your working surfaces yet still easy to access. Manufactured from sturdy steel and with plastic caps that help prevent items from accidentally slipping off, you'll want several of these handy pegboard hooks for use in your workspace area. For the larger, harder-to-hang items in your workshop, such as hammers, chisels and gardening shears, look no further than these 4-inch double arm pegboards hooks. 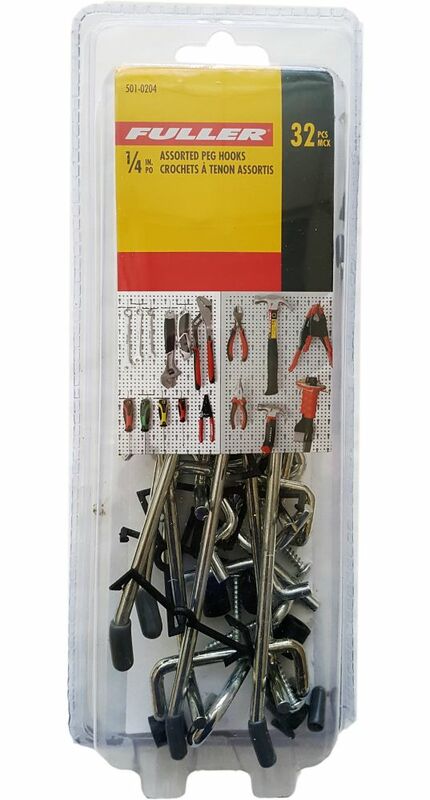 Easy to mount on pegboard, they feature two sturdy steel arms to ensure your tools stay secure, in place, and don't wobble around. A quality bicycle can be expensive. What's more, they can also weigh more, especially if they have a heavier frame. To ensure your bike is held solidly when storing it, you'll want to have a set of these heavy-duty bicycle hooks on hand. Rated to hold up to 30 pounds each, they readily screw into a solid wooden post or beam without tools and make stowing and retrieving your bike fast and easy. The foam rubber ensures the finish on your frame or tire rim doesn't get gouged, scratched, scuffed or marred. 1/4-inch Assorted Pegboard Hooks (32-Piece) This 32-piece set of assorted pegboards hooks is the answer for all of your many storage and organization needs throughout the house, garage and in the toolshed. Made from durable steel and with plastic stabilizing clips included, this general-purpose selection of pegboard hooks will make hanging, storing or displaying your things simple.